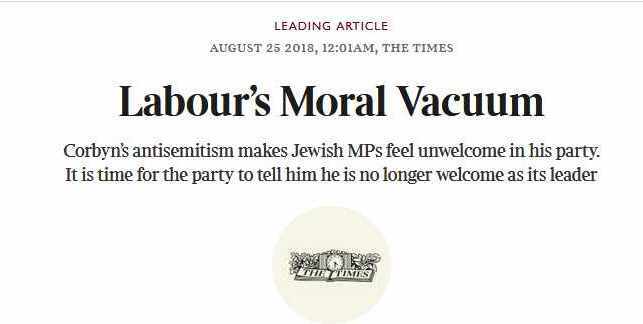 Without a trace of shame - The Times, which refused to criticise Hitler, calls for Corbyn's Resignation for 'anti-Semitism'! “-- Did you hear that Jeremy Corbyn, in a speech in 2013, said that British Jews weren't really British even if they were born there? -- Really? He said that? -- Well, he intimated that British Jews couldn't grasp British irony and didn't understand history." -- Really? He was referring to Jews? -- Well, he didn't SAY Jews, but he said that about UK Zionists, which is a leftwing code term for British Jews. -- Hang on, he made a reference to UK Zionists as a group? -- Well, not exactly. Actually, he was referring to some pro-Israel members of the audience who came up and started arguing with the Palestinian ambassador who had presented the history of Palestine and used irony, which Corbyn thought these guys didn't get. He specifically referred to "the Zionists in the audience." -- So, you mean to say he did not refer to British Zionists as a whole, but he was saying that the Palestinian ambassador, who is Armenian Palestinian, had a greater grasp of British irony, than these Brits who had lived their all their lives? -- Yes, that's about it. -- So, in effect, he accused pro-Israeli members of the audience, whom he referred to as "Zionists", which they are, and who argued with the Palestinian ambassador, with being humorless and misunderstanding history, compared with the Palestinian ambassador. Last week Richard Millet became the hero of the BBC and the media ratpack in their war against Jeremy Corbyn. Millett appeared on the BBC’s 6 O’Clock News last Friday as a victim of ‘anti-Semitism’. Millett was even the cause of a splutteringly dishonest Leader in The Times last Saturday ‘Labour’s Moral Vacuum’. According to The Times Corbyn ‘used the word “Zionists” as a synonym for “Jews” and as a term of casual abuse.’ which is a good example of how the sins of the British press are visited on their victims. It is The Times and the rest of the yellow press which can’t distinguish between ‘Jew’ and ‘Zionist’. The Jewish Chronicle’s far-Right editor, Stephen Pollard also asserted that ‘the Labour leader 'used the word "Zionist" obviously to mean "Jews". There is nothing obvious about this at all of course. Corbyn was careful to distinguish between Jews and Zionists, unlike the Jewish Chronicle. 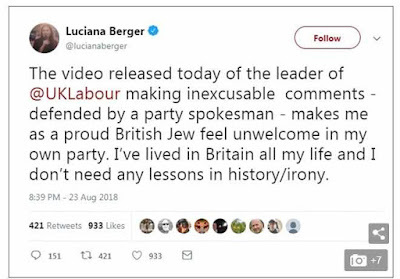 Corbyn's innocent remarks made five years ago make Luciana Berger feel unwelcome in the Labour Party - what makes her feel unwelcome is a socialist leader! Richard Millett is one of the best known Zionist thugs and bully boys amongst a group of Zionists whose sole purpose is to disrupt Palestinian and anti-Zionist meetings in London. In December 2017 I did a feature on 31 of these Zionist fascists, misfits and assorted thugs. 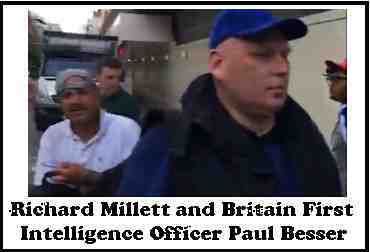 Richard Millett was number 13 on the list and the piece on him was accompanied by a picture of him with Paul Besser, former Intelligence Officer for the neo-Nazi Britain First group. So much for his opposition to anti-Semitism! Absurdly the Times article quotes Millett as claiming that he was frightened of recriminations if Corbyn was toppled as a result of the row. “I don’t know what will happen,” he said. “I am scared on a physical level and the Jewish community is upset about what they see is happening. I think we are all scared.” Likewise the Mail claimed that Millett and the Jewish community was 'scared on a physical level' because of the false accusations of Labour anti-Semitism. Millett and fellow Zionist thugs and fascists demonstrated with Tommy Robinson’s Football Lads Alliance at the Al Quds demonstration last June yet they have the chutzpah to claim they are physically frightened of their opponents! It is a sign of the degeneration of the British press and the BBC that they take these claims at face value without even doing a cursory investigation into their background. The incident happened just a few weeks after a policeman was murdered at the House of Commons. There was an increased armed police presence.Mark Hendricks MP called the police (he did not ask for "armed police" as Millet implies. Because of the increase security immediately after the murder an armed police detail was closest and first to arrive. However, and this is what is important, the armed police explained that they would not remove the disrupters and called for regular police to deal with the situation. I was there and clearly heard all this as Millet also did. This apparently is anti-Semitic according to the paper which supported Hitler before the war! Clearly Zionists don’t want to study so much as rewrite history and their appreciation of any form of irony is close to zero. Blumenthall and solicitor Mark Lewis were recently on the BBC's Victoria Derbyshire programme explaining how 'antisemitism' was forcing them to emigrate to Israel. Even a cursory investigation would show that she is a leading Zionist, a member of Herut . The whole basis of Zionism is that Jews don't belong in this country and should emigrate to Israel. Although the Mail does not mention Millett the video link is from Millets blog where he is seen and heard shouting throughout. The DM journalist, Jake Wallis Simons, is a virulent Zionist who is close to Mandy Blumenthal, organiser for the far-Right semi-fascist Herut group who featured at Number 28 on my list of Zionist fascists. Wallis-Simons is the go-to guy for Blumenthal whenever she or the misnamed Campaign Against Anti-Semitism want publicity about emigrating to Israel, anti-Semitism etc. 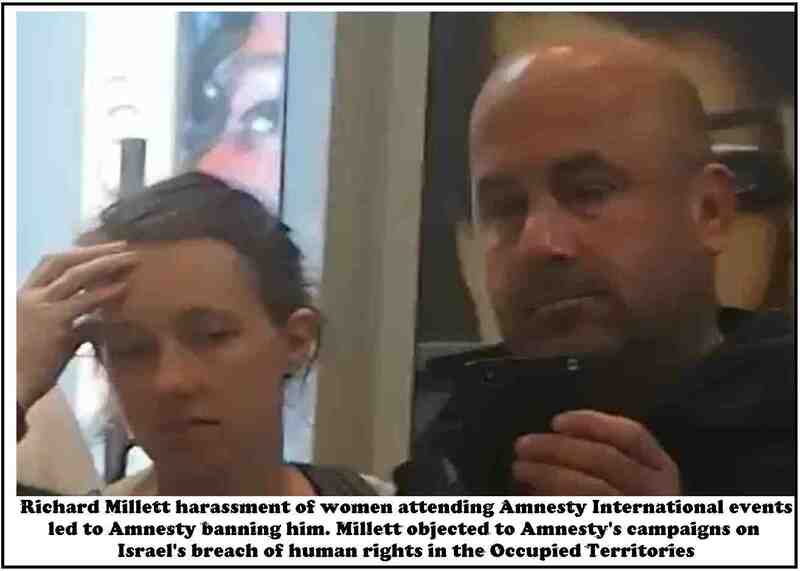 What the BBC, the Mail and The Times didn’t tell their readers was that Millett has been banned, along with Jonathan Hoffman, for harassing people at Amnesty International events as the 3 videos I am putting up show. Millett is clearly no shy and fearful Jew in these videos, rather a loud mouthed bully. Eight years ago there was a campaign in London against a shop Ahava in Covent Garden. It sold stolen products from the West Bank. We picketed it every other week and eventually they were evicted from the premises because fellow shop owners were fed up with the constant pickets. Millett was active, with Jonathan Hoffman in supporting the shop. In the course of a demonstration one day, a staff member at the shop accused Jewish protestors against the shop of being ‘Christ killers’ and when asked to explain this remark she said that it was 'because you are Jewish’. What was the reaction of Richard Millett to this vile anti-Semitic trope, an accusation that has led to thousands of Jewish dead in Easter pogroms? An accusation which was at the heart of Christian anti-Semitism for centuries? 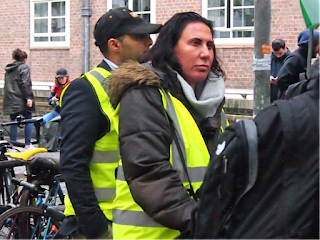 As you can see at the beginning of the video the woman is angry that the activists are now specifically targeting her! Her apparent remark about Jews killing Jesus (although, no where in the footage do we actually hear her say that) is a remark to a male, Jewish activist who spends large proportions of his sad life hanging around outside the Ahava shop. This is disingenuous as we can clearly hear in the video a Jewish demonstrator asking why she had called them 'Christ killers'. She didn’t deny it. Her response was ‘Because you are Jewish’ thereby accepting that this was what she said. There was therefore nothing ‘apparent’ about the remark. Millett clearly has no problem with anti-semitism when it is directed at the 'wrong sort of Jew'. I don’t blame her for an off-the-cuff remark when confronted by a group of bullies. It was an 'off the cuff remark' as was Jeremy Corbyn's suggestion that he brush up on his history and English irony. However Corbyn is the worst anti-Semite since Adolf himself according to Millett and the Zionist chorus in the press. Thus we see that the only concern of Millett is to protect an Israeli shop, trading in the stolen minerals of Palestine, from being closed down. Anti-Semitism is only a useful propaganda tool for this racist thug. ‘For almost 2,000 years in Western civilization, four words legitimized, rationalized, and fueled anti-Semitism: "The Jews killed Christ…. For hundreds of years those four words - acted out, spoken out, sermonized out - inspired and legitimized pogroms, inquisitions and expulsions. Hitler, in 1934, visited the Oberammergau Passion Play, and when he left, he proclaimed (and I paraphrase): "The whole world needs to see this Passion Play, for then they will understand why I despise the Jewish people." Many during the Holocaust who killed Jews from Monday to Friday went to church on Sunday and there was no disconnect for them, because, after all, all they were doing was killing "Christ killers." So when the press report that Millett was upset by Corbyn's 'antisemitism' we should take this with a very large dose of salt. The concern of the Daily Mail and The Times about anti-Semitism contrasts with their indifference to racist violence against Muslims, Gypsies and other minorities in this country. The same Daily Mail which employed Katie Hopkins who described migrants as “cockroaches” is apparently concerned with ‘anti-Semitism. What is less well known is that The Times, throughout the period from 1933-39 was not only an advocate of appeasement of the Hitler regime but that its editor Geoffrey Dawson adamantly refused to cover the growing persecution of Jews in Germany. Dawson was a member of the pro-Hitler Anglo-German Fellowship which was a Tory pressure group formed by influential personalities in British society, among them the banker and industrialist Ernest Tennant, a ‘personal friend of Joachim von Ribbentrop, then ambassador of the Third Reich in the United Kingdom.’ In 1946 Ribbentrop was hanged at Nuremburg having been found guilty of war crimes. Amongst other things The Times supported Himmler’s annexation of the Sudetenland in Czechoslovakia as part of the appeasement of Hitler. So when we hear The Times or the Mail today telling us how aghast they are the ‘anti-Semitism’ of Jeremy Corbyn, when we know that their attitude to the Roma, Muslims and refugees has not changed one iota, it is fair to draw the conclusion that what they are concerned with is not racism against Jews but opposition to Zionism and the State of Israel. See also Skwawkbox's article Two ‘zionists’ criticised by Corbyn called ‘rude yobs’ – by RIGHT-wing, pro-Israel Streeting on the time when right-wing MP Wes Streeting called Millett and Hoffman 'rude yobs' for trying to disrupt a meeting he was chairing on Palestinian human rights. 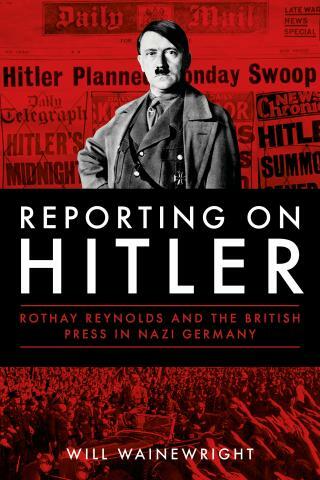 See below the full review of Will Wainewright’s book on Hitler and the British press. Put foreign correspondents together, beer in hand, and chatter will soon shift from the news of the day towards the casual brutality of editors; their failure to spot the significance of a story, their talent for inserting precisely the wrong word in a crafted text. Editors, eh, don’t you just love them. struggled with an editor, the Yorkshireman Geoffrey Dawson, who agreed with his chums in clubland that Britain had to be at peace with Hitler. The Manchester Guardian correspondent had no problems persuading his boss to publish accounts of Nazi persecution, but try as he might could not talk him into an editorial policy in favour of arming up for a war against the Third Reich. The reporters saw what was going on around them in Germany — the Jews humiliated and beaten on the street, the persecuted churchmen and communists, the opening of the first concentration camps, the histrionic rallies — and choked back their frustration. It did not help that Gestapo snitches sat next to their Stammtisch. Or when the Nazi foreign ministry sent a smooth official to their table to give a positive spin on new restrictions on Jews. “There are, I think, times when a correspondent should be a diplomat,” the official told them. 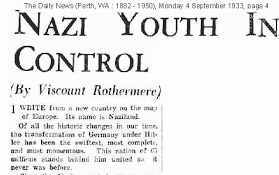 Rothermere travelled to Germany in July 1933 and was entranced, writing an editorial headlined “Youth Triumphant”. There was an unfettered national spirit, soon Germany would rival Mussolini’s Italy as the best-governed country in Europe. He struck up what he considered a friendship with Hitler. Imagine then how the Mail’s Berlin correspondent, Rothay Reynolds, must have squirmed. Will Wainewright tells his story in this fascinating book, a short study in conscience denied. Reynolds is a distant relative and Wainewright stumbled on a letter written by him after the outbreak of the Second World War, by which time he was both safely out of Nazi Germany and the Mail. The story that emerges after a bit of digging is of a devout man, an Anglo-Catholic who took Holy Orders, was sent as a young assistant chaplain to the British community in St Petersburg, and after a while chose to become a Roman Catholic. That meant leaving his job and since he was 33, good at languages and Russia in 1905 was in ferment, he decided to become a stringer for the Daily News. While there he befriended Hector Hugh Munro, the writer Saki. By the time he landed the job of Daily Mail reporter in Germany in the 1920s, Reynolds had done some war work, writing propaganda fake news for MI7, the disinformation wing of the Secret Service. The full scope of Wainewright’s problem as a biographer becomes clear by this stage: Reynolds arrived in Germany as a middle-aged man having, it appears, chosen to be a foreign correspondent because it suited his solitary nature. We find out almost nothing about him. There is a girl called Jane whose hand he touches, but nothing comes of it. He may or may not have had dealings with the Secret Service in Berlin. Faced with some of the most dramatic unfurling events in 20th-century history, he fails to find a journalistic voice. Rothermere’s Führer-love bought access to Hitler, but he did neither his newspaper nor his country any good. Had Reynolds been more gifted he might have been able to find himself a niche between an overbearing proprietor and an evil regime. Instead, he made some token acts of solidarity, publicly reciting the rosary in the street, for example, but he did not distinguish himself. Almost everyone seems to stand out more strongly than Reynolds By contrast Sefton Delmer, of the appeasement-supporting Daily Express, demonstrated some rat-like cunning. Delmer arrives at the Reichstag after it has been set ablaze before Reynolds, but after a reporter for The Times, Douglas Reed, who has just been kicked out of the building by Hermann Goering. Delmer sees Hitler’s Mercedes approach and enters parliament in the Führer’s slipstream, landing a suspiciously long and coherent quote from him about setting the whole continent ablaze. Reynolds’s real admiration was for The Times’s correspondent Norman Ebbutt. The wrestling between correspondents, Dawson and some of the leader writers about appeasement has already been well chronicled. Yet the author has dug deep in The Times’s archives and come up with some blistering reports. Here’s Ebbutt on the 1936 “election” held just after Hitler had sent his troops into the Rhineland, in breach of the Versailles Treaty. The work of the Hitler regime, he said, had “been done at the expense of freedom, truth and justice as these are conceived in the western world, and some who feel bound to support the Führer tomorrow on the patriotic issue will do so in fear and trembling that they are delivering Germany over to a new wave of National Socialist fanaticism”. That’s telling it as it was, even if that day’s leader struck a rather more emollient note. 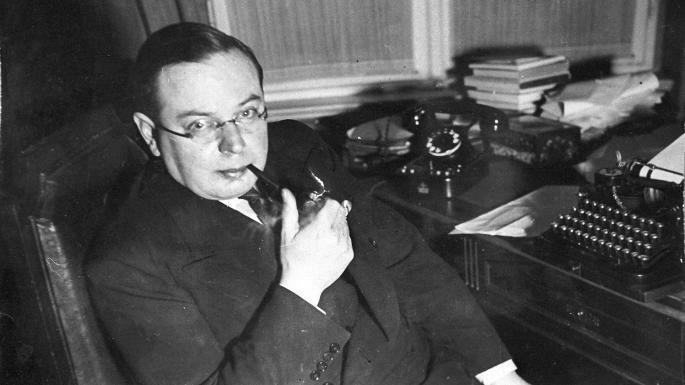 Ebbutt was thrown out in the summer of 1937 (“By far the best correspondent here left this evening,” wrote the American reporter William Shirer) and he was seen off at the station by 50 correspondents who knew that their days were also numbered. Wainewright doesn’t know if Reynolds was there. The Nazis had warned the reporters not to give Ebbutt a send-off so perhaps Reynolds decided that discretion was the better part of valour. That seems to have been his watchword.